Another visit to Old Warden, and I’m ashamed to say only my first Carrier meeting of 2017. This time the weather tried hard to make life miserable on Saturday, raining relentlessly for the latter part of the afternoon, but despite this there was deck activity up ’til 15:00, and then throughout the day on Sunday. Perhaps the forecast put some potential visitors and pilots off, as the aerodrome didn’t seem to be as busy as usual, but nonetheless the happy band of Carrier fliers pressed on, and one exceptionally high score (and some spectacularly low ones too!) made it a meeting to remember. 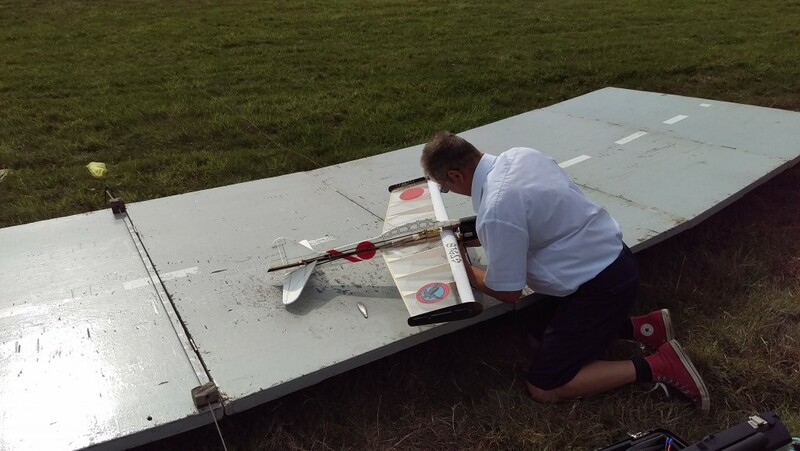 Nigel Frith campaigned his Mitsubishi Zero on Saturday only – he didn’t need to fly again on Sunday because his third flight had already netted him an astonishing 300.6 points, way in advance of any likely challenge, despite the presence of several other major-league pilots at the meeting. Having tested out the conditions with a sacrificial first flight (3 warnings and a DQ) he then returned to the deck to score 285.5 with his second flight, followed by that 300 on his third. Nigel has rammed home the benefits of light weight, electric power, and expert piloting over the past couple of seasons, and he is now the man to beat. Chris Howell wasn’t far behind, nearly matching Nigel’s second-best with 284.9, which was enough to ensure that he took second place. Chris seems (paradoxically) to have benefitted from the loss of all his previous models to theft two years ago. It’s forced him to build anew, and in doing so he has also embraced wholeheartedly the low-weight, electric power paradigm, just like Nigel. 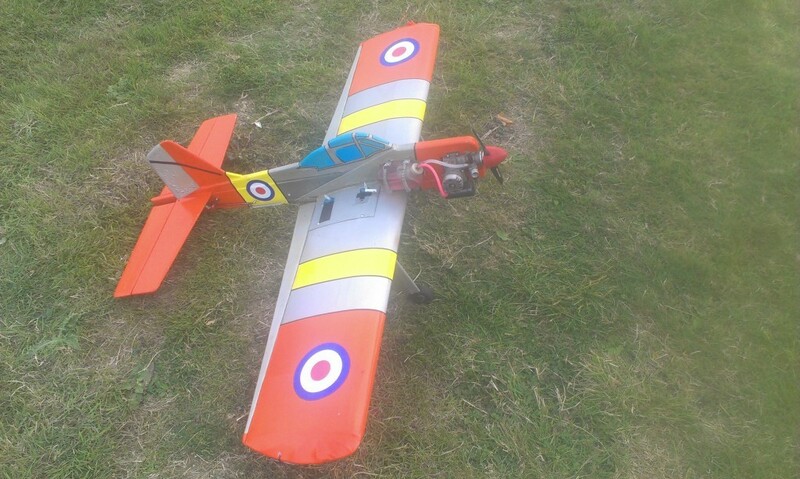 This time Chris flew his Martin Mauler, which is once again based upon an R/C foamie, like last year’s Wildcat. Peter Tribe flew on Sunday only, bringing his desirable Grumman Skyrocket to the deck – it’s an unusual prototype and all the better for that (it’s one of my favourites!) and it flies beautifully. 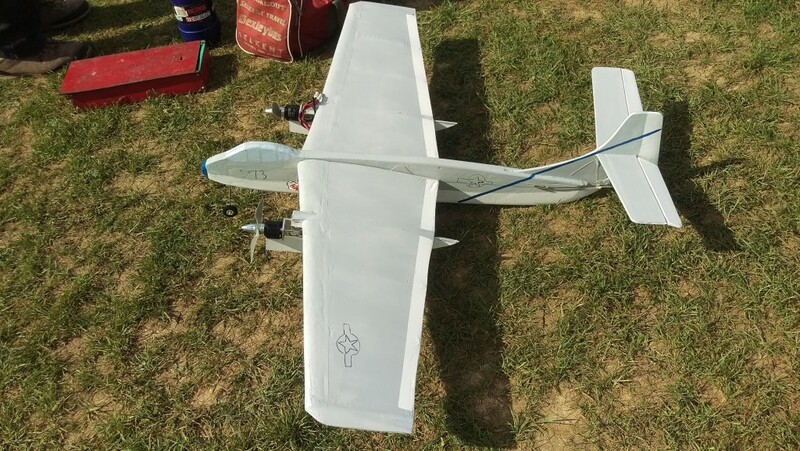 Peter’s first flight returned a very competitive 258.7 points, enough for third place, again with electric power, which seems to be essential for the trouble-free operation of multi-engine models; however, the Skyrocket has a conventional non-foam airframe. It was good to see our regular continental visitor Jan Odeyn at the meeting, and his excellent sense of humour and good advice gave me at least something worthwhile to take home along with my broken models! Jan flew all-electric, putting both his Tigercat and Guardian into the air. The Tigercat was obviously the more competitive, returning 237.1 and 251.1 points, the latter flight giving Jan fourth place. Mike Welch had flown his NA Savage last season, and is now getting it into the 200+ point zone. 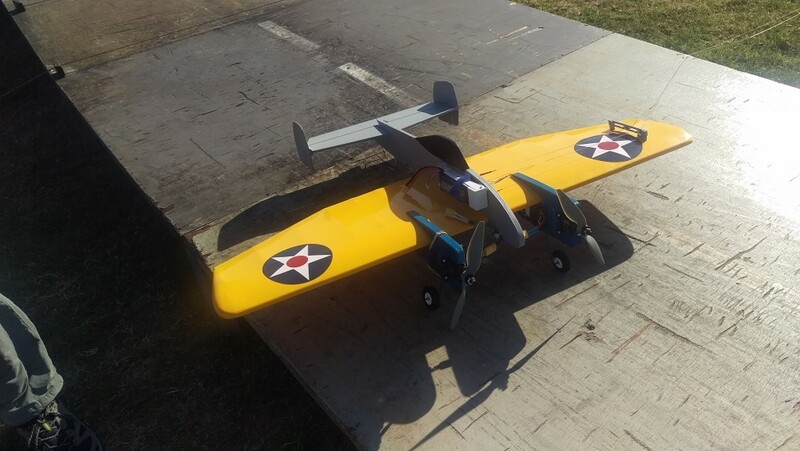 This is another unusual prototype (a twin engined ASR-type plane), again electrically-powered, and it gave Mike fifth place with 214.0 points. 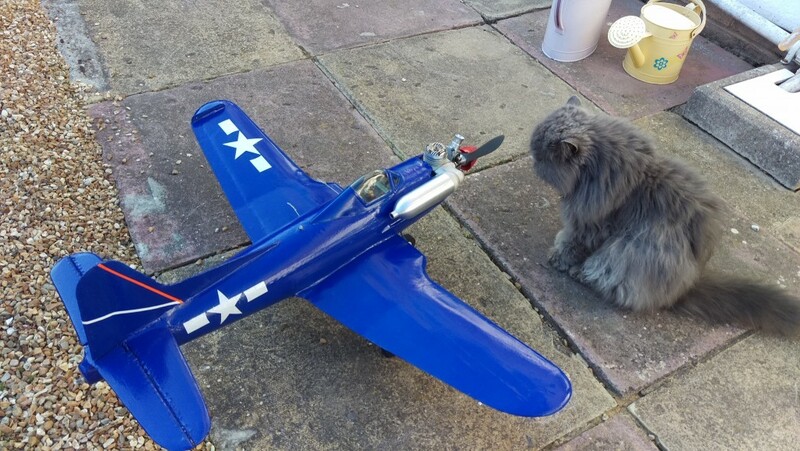 Mike was also involved with the Scale competition at OW, entering his “Utterly Butterly” Antonov AN-2, and bringing along four or five others for fun flying. It was interesting to see his Special Operations all-black Lysander on the field, knowing that there was a full-sized 1:1 scale version of a Lysander in the same livery in the hangar 50 yards behind it! You might be forgiven for wondering if anyone is still using I/C powere in BCD. Well, the answer is yes, they are, but at this meeting no-one flying a glow-motor was getting anywhere near the top of the list. 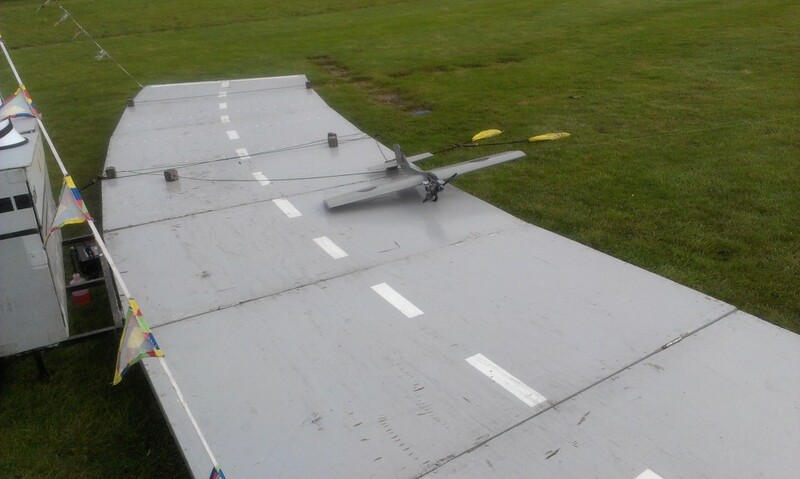 Chris Hague, a fellow M3 traveller from Poole in Dorset, must have been very pleased with his performance.His immaculate Fairey Spearfish flew successfully on all six flights, with scores covering a wide range between 102.8 (his only missed landing) to a very respectable 200.9. Well done Chris – you’ve beaten me in joining the “200 Club”! I’m particularly pleased for him because he flies I/C (West 36 R power) and builds beautifully-finished models using conventional materials. Dave Cowburn is another I/C flier (he’s no fan of “electrickery”, as he often says!) and, like Chris Hague, builds lovely models that capture the original essence of Carrier flying. His Seafang made three scoring flights on Saturday, but with two 20-point landings and sub-85 point scores he’d obviously decided that a change was needed for Sunday. His trademark U-2 duly flew and delivered the goods with a steady performance, netting Dave 163.2 points for seventh place. Bob Phillipps has always been a consistent performer with his West 36-powered Supermarine 508, so it was rather a surprise to see him campaigning a Short Seamew with a cute(!) little SC15 at this meeting. 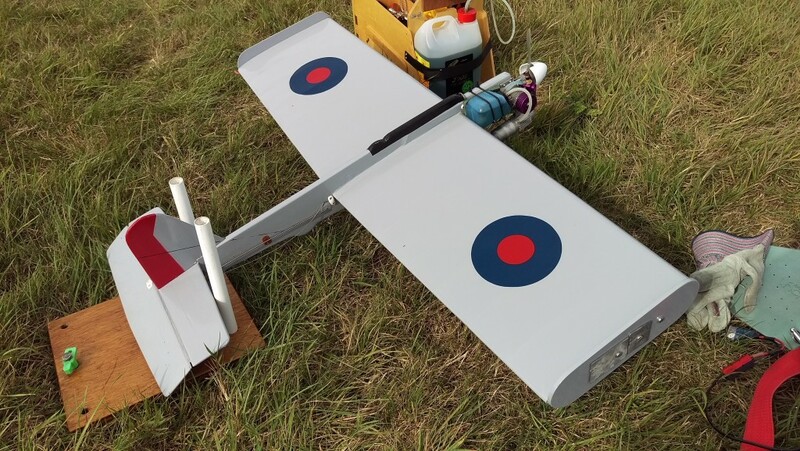 I didn’t get a chance to talk to him, but when chatting to Jan I understood that Bob is experimenting with smaller, lighter models to see if the success enjoyed by Nigel and Chris can be repeated with I/C-powered planes. A poor landing robbed him of a 140+ score, but even so it would seem that he has some more development work to do to become competitive. Nonetheless, he scored 92.7 for eighth place. Ray Ewart is a perennial campaigner in Carrier, and he’s now the owner of that lovely profile scale Sea Balliol that has wowed everyone over the past few years because of the quality of its finish. However, it has never really performed well in Carrier rather than in Scale events, and Ray has still to get used to it. His one flight ended in a DQ in the slow segment, but he will, I’m sure, start to score with it soon. My contribution to the meeting was fleeting, to say the least. Saturday was taken up with SAM35 business and then that awful rainstorm, so I was pinning my hopes on some better weather and some points on Sunday. Well, the better weather materialised, but the points? No way! It all started to go wrong before I even left home. 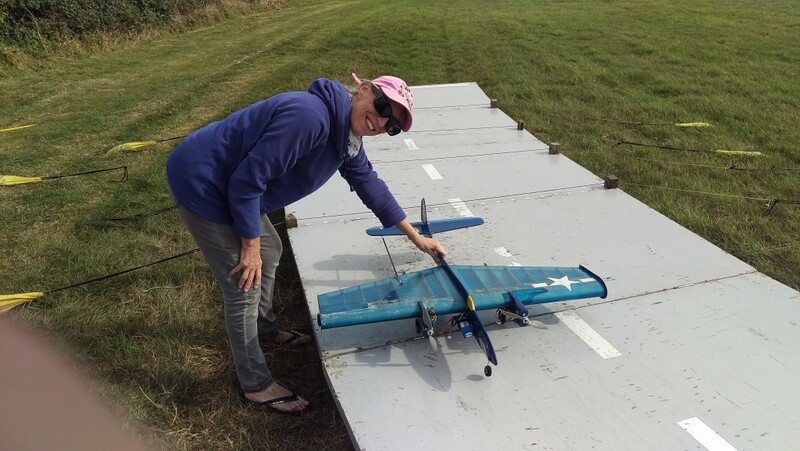 The previously-reliable R/C throttle on my dual-class new-build Dark Shark failed on final test before loading up for OW, leaving me banging my head on the wall in frustration. 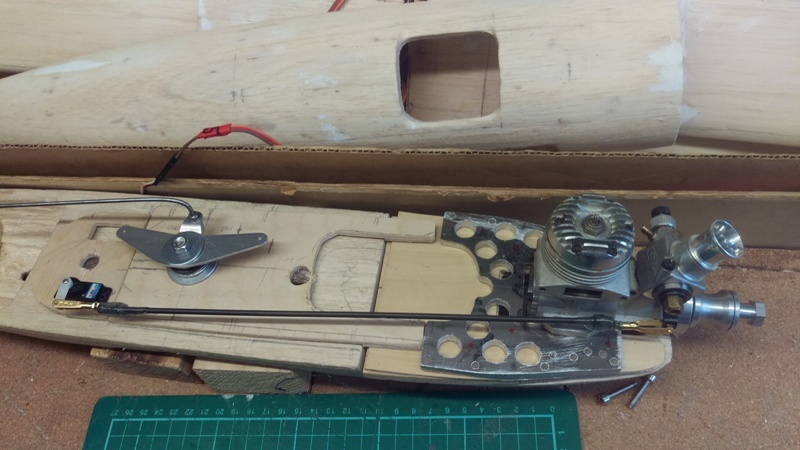 It had worked perfectly for three months throughout the build, but now the servo has locked solid so I’ve got to cut a large hatch in the hollow log fuselage to change it – a real pain. 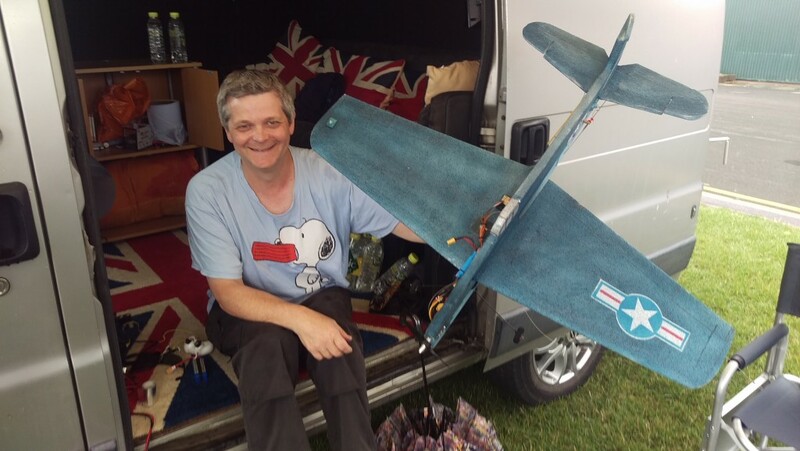 Gary Chuch had the doubtful privilege of propping up the results list, with a single flight from his Irvine 36-powered Guardian on Saturday.He was DQed in the slow segment of his only flight, didn’t score and found himself in twelfth place. Finally, the usual drive back to the hotel takes me past the Airship hangars at Cardington, but for five years there’s never been anything to be seen outside those massive sheds. So, I was amazed and pleased to see the famous “Flying Bum” (aka the Airlander) dirigible sitting on the tarmac near the hangars. 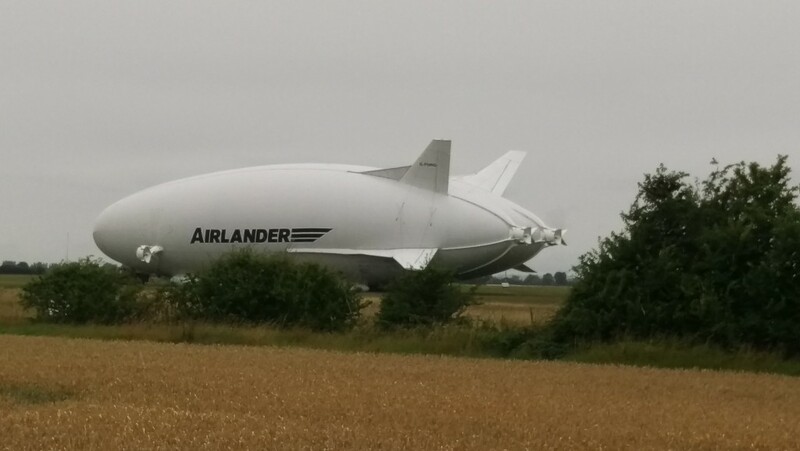 Developed as a cheap means of delivering material and supplies in an economic and eco-friendly way, the Airlander will hopefully have a more successful career than most of its predecessors – think R100, R101… It’s already had two hard landings, resulting in serious damage, so let’s hope that it can now make it third time lucky and become a sight of wonder in the skies all over the world!